The Make-Up Forever Flash Palette is a make-up artist cult classic. The formula has changed since the original “Oily kit” (which, I am reliably informed by Kevin James Bennett, was originally made by Kryolan, using Supracolour shades), but is still just as popular. I had been reluctant to buy it for ages as I didn’t have a real need for it, and it’s pretty expensive to buy just to experiment with. Over time, I have been really condensing my kit and replacing old items with multi-taskers rather than just buying replacements. I bought the MUFE Flash palette (£47.78) with the 35% pro discount at UMAE a year or so ago. So how did it do? Well, the more I play with it, the more I like it. First and foremost, it is more of a greasepaint, rather than a cream product. What does that mean? Well, it won’t dry the same as cream foundations. It is oil-based waxy pigment that had traditionally been used in theatre makeup and in special effects. Greasepaint is thicker and more emollient than traditional powder foundation that had been used in theatre up until the 1870s. Greasepaint is still used in theatre today and is an sfx staple. The bold, thick paints are fantastic for creative looks due to their smooth, oily finish that photographs beautifully. If wearing for longer periods of time, it does need to be set with powder products in order to avoid smudging and creasing. When I’m using greasepaint in creative shoots, I don’t always set with powder, as I like to be able to smear, re-blend and manipulate the colour in different images to create different looks. In the first mage above, I used the Flash Palette yellow on the eyes and blended with the canary yellow powder eye shadow from the Viseart Editorial Brights palette. I wasn’t too precise about the blending as I wanted a rough look on the eyes, to complement the smudged ‘etch-a-sketch’ look on the lips. 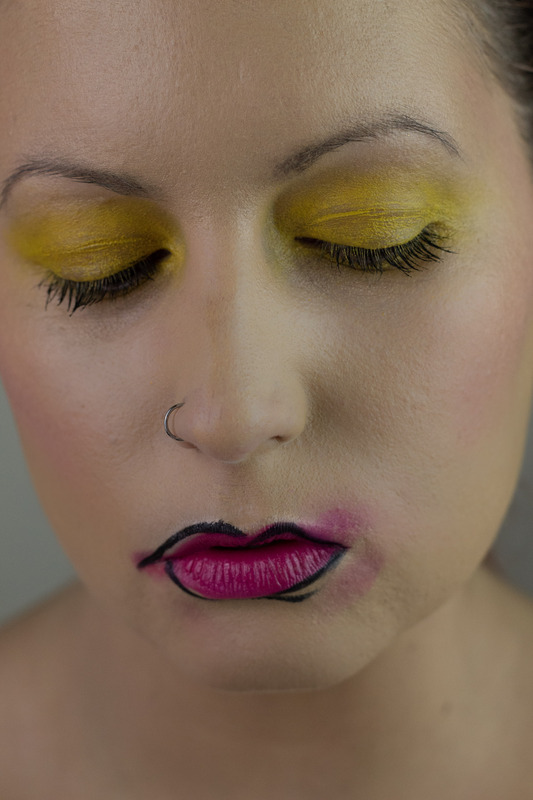 I used the black paint from the MUFE Flash palette for the comic-book/ cartoon/ Picasso inspired black lip line. The lipstick was regular satin finish lipstick, Maybelline Fuchsia Flash, applied to the lips and intentionally smeared before the black lipliner was added. In the second image, I only used the blue shade from the palette. I initially wanted a crisp line that I could set with blue powder shadow but I forgot to ask my model to keep her eyes closed while I switched brushes. She blinked and it smudged. I loved the natural smudge that it created and suddenly it was ‘screw crisp clean lines, let’s contrast the smeary blue with the crisp orange and white eyeliners’. Boom! The look was simple but effective. In both of the above images, I started with a clean beauty look using traditional foundation, blush, contour etc, and then added the greasepaint on top to create the bolder colourful looks. I like to squeeze out as many looks as I can from every shoot and so starting with a clean beauty look, layering on greasepaint, and finishing with a heavy smokey eye look works well for my workflow. In the above shots, I used the colours as-is and didn’t blend or mix together. On other shoots I have used multiple shades and blended them to sue as blushes, lip color, eye paints and more. The Flash palettes are so versatile and if you know your colour theory well, you can easily do a full face of makeup with just the Flash palette. What are your experiences with the flash palette? I’d love for you to share your pics and tag me on Twitter/ Insta. Leave a reply on "Working with greasepaints"